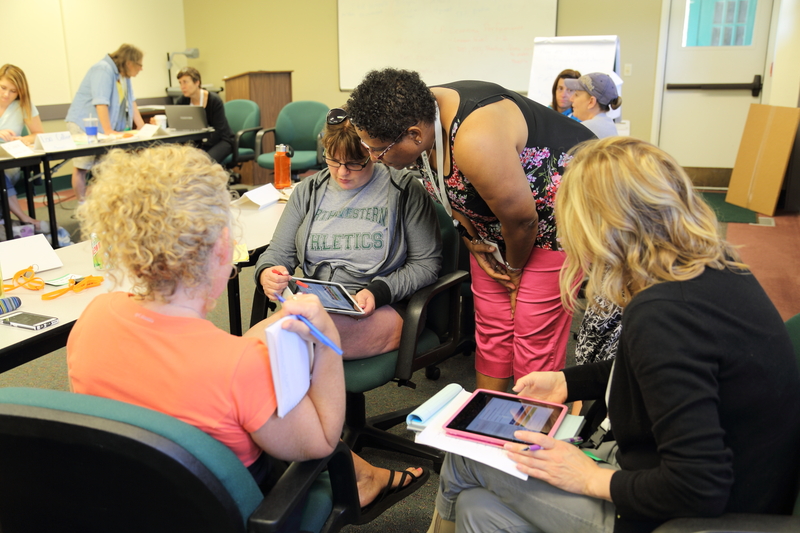 The Kellogg Biological Station and CREATE for STEM will again offer summer professional development for elementary teachers. Session I will take place July 17-20, 2017 at the Kellogg Biological Station . Session II is tentatively scheduled (pending grant approval) for July 24-28, 2017 at MSU Extension's Tollgate Farm and Education Center in Novi, MI. Check back at http://www.kbs.msu.edu/outreach/elementary-teacher-program/ for updates and further details. One summer day in July, the sun highlighting the shimmering turquoise of nearby Gull Lake, a teacher holds a crayfish by the tail. She approaches a cluster of her colleagues, fellow teachers talking amongst themselves as they encircle a pile of objects they’ve collected from the bucolic grounds of Michigan State University’s W.K. Kellogg Biological Station (KBS). The crayfish is added to the pile, and deliberation begins on how to sort the objects. 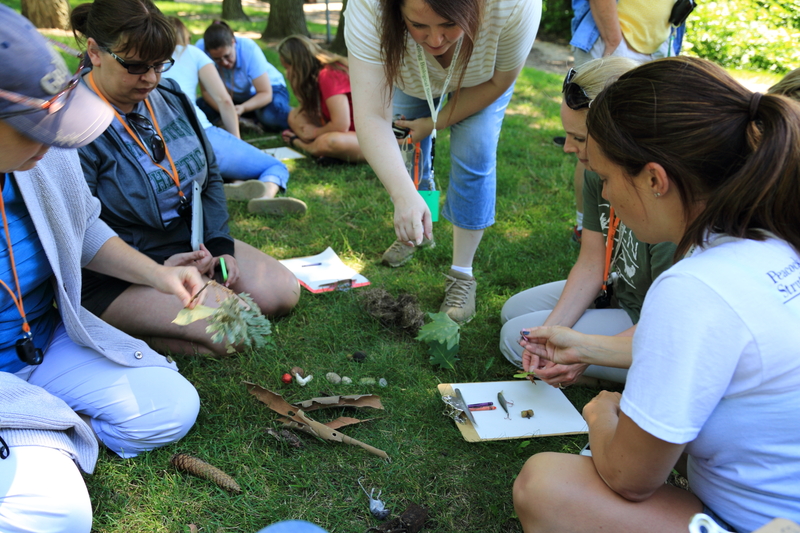 The teachers are in the middle of an “investigation” - a central component of the Teaching Science Outdoors program, a collaboration between KBS and the CREATE for STEM Institute at Michigan State University. Elementary school science teachers from Davison to Kalamazoo have come to this professional development program not only to interface with their peers about teaching elementary science but also to participate in these outdoor activities. The hope is that the exercises will inspire lesson ideas that the teachers can implement in their own classrooms once their students return from summer break - lessons that take advantage of the outdoors to provide kids with opportunities to be scientists, in settings perhaps no different from the kids' own backyards. The goal of this mid-Tuesday investigation is to find 10 unique objects in 15 minutes, then sort them into categories of each group’s choosing. The teachers survey the surface of the lakeshore field, venturing into wooded areas to find acorns, bark, and pinecones. Others journey toward a pagoda overlooking the glittering waves of the lake, searching for objects just past the concrete edge of the pavilion. One teacher leans in, peering past her toes, looking for something among the shallow water that could be grabbed with bent knees and an outstretched arm. Leaves, mushrooms, acorns, sticks, feathers, abandoned crayons - an eclectic mix of items both natural and discarded forms the teachers’ collection, soon to be sorted. The debate continues on whether the crayfish belongs in “animals,” “dead things,” or if the group’s current system of categorization should be abandoned for a “man-made”/“naturally occurring” dichotomy. This outdoor investigation, the second postprandial activity of the afternoon, was preceded by an indoor discussion of how best to turn the previous day’s investigation into an elementary science lesson. Inside the station’s Carriage House classroom, Kara Haas, Science Education and Outreach Coordinator at KBS, prompted her teachers-turned-students to organize themselves into small groups of peers who teach the same grade level. “Can you navigate NGSS?” asked a projected slide at the front of the classroom. The Next Generation Science Standards are at the heart of the lesson planning in this week-long program. 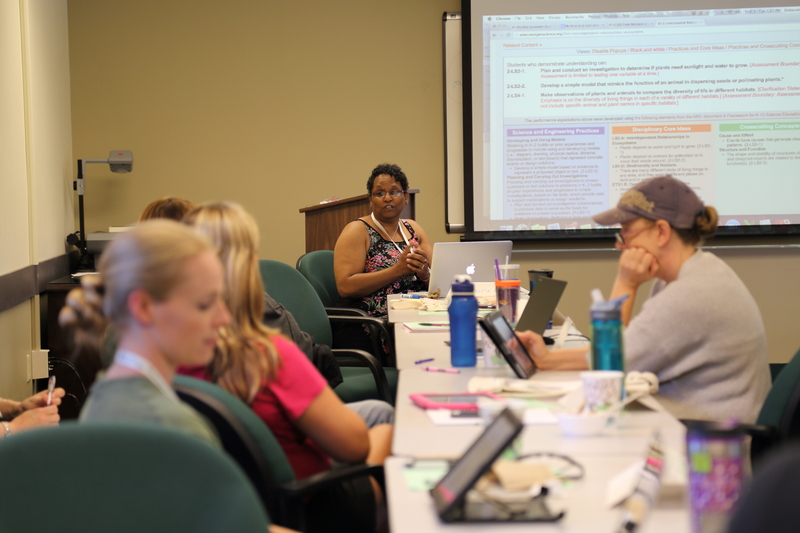 The standards are not a requirement for science curriculum in Michigan, but these teachers want to be prepared for the standards’ likely future adoption. From its inception, the aim of TSO has been to “teach inquiry-based science outdoors aligned with NGSS,” says Tali Tal, a researcher from the Technion Israel Institute of Technology. Tal developed and piloted the TSO program with KBS while on a year-long sabbatical at CREATE for STEM. Once organized, the teachers identified PEs, or “Performance Expectations.” These are statements that encapsulate the “three dimensions” of NGSS - practices, disciplinary core ideas, and crosscutting concepts - into something to be assessed. The latter two of these dimensions were referred to onscreen as acronyms, but the audience of educators was unbaffled by the jargon. These are terms they are familiar with, and happy to see expounded upon. Ian Zaback, Science Education intern at KBS and a junior at MSU, is particularly pleased that he regularly gets to watch teachers apply NGSS to their curriculum, because he’ll soon have to do so himself. The aspiring high school biology teacher considers himself a fan of the dynamic, active approach of education under NGSS. The standards train science students to be scientists, he says, adding, “If students don’t leave science class without being curious about the world, we haven’t done our job.” The Teaching Science Outdoors program is all about giving teachers ideas for lessons that inspire such curiosity. Deborah Peek-Brown, Academic Outreach Specialist at CREATE for STEM, spoke at the front of the room following the discussions among the pairs. She remarked on how ideas build throughout successive grade levels as she motioned toward a projected NGSS chart. The teachers then put their heads together to develop LPs (or Learning Performances), claims for what students should be able to do after one to three lessons. The Kellogg Biological Station has become a popular destination for Michigan teachers seeking professional development opportunities. The very same day that the Teaching Science Outdoors crowd brainstormed learning performances, another group upstairs, sponsored by the National Science Foundation’s BEACON Center, was equipping teachers with the skills and resources they need to teach evolution. 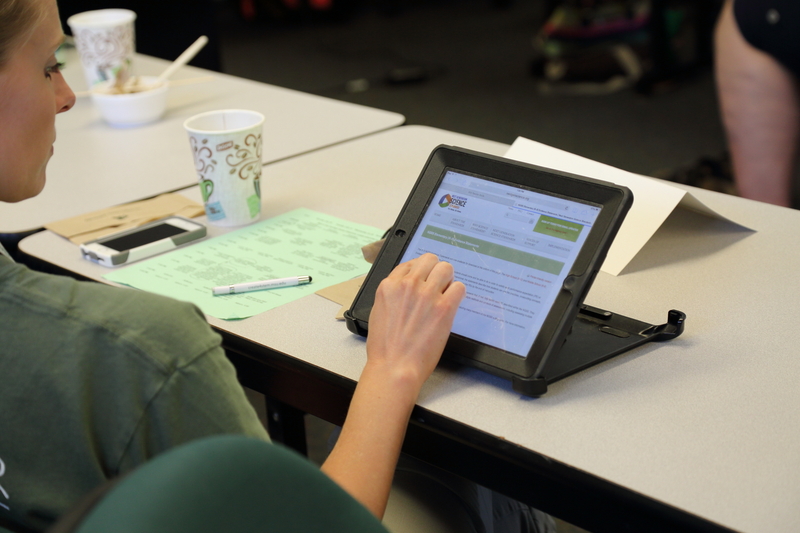 The following month, KBS plans on offering their three-day K-12 Partner Summer Institute. Funding for teacher participation in the program was generously provided by an anonymous donor to KBS. Additional support came from CREATE for STEM. Teachers interested in participating in a future program at the Kellogg Biological Station can find more information on the KBS website, http://www.kbs.msu.edu/. Article by Josh Anderson. Photos by Erin Surge. Josh Anderson is pursuing a degree in Professional Writing at Michigan State University. You can view more of his work at joshanderson.me. Erin Surge attends Michigan State University and is studying Professional Writing.